Dropa Stones -  An epic journey of new discovery so fantastic that our natural instinct would be to block it out. ​one of the greatest unsolved mysteries of the world? The alleged story of the Dropa Stones is as follows. In 1938, an archeological expedition was sent to investigate a secluded area of the Baian-Kara-Ula Mountains on the border that divides China and Tibet. The group discovered a series of caves at the summit of the mountains. The caves contained a large collection of graves and the walls were decorated with drawings of people with elongated heads together with images of the sun, moon, and stars. ​The archeologists uncovered the graves and discovered the remains of ancient beings. The skeletons were a little more than three feet tall, with abnormally large skulls. Inside of the tombs a collection of stone disks were recovered. The disks were almost twelve inches in diameter, with a hole in the center. The objects had a groove on the surface of the disk and spiraled outwards from the center hole forming a double spiral. Closer inspection showed that the grooves were actually a line of small carvings or signs. "The Dropa came down from the clouds in their aircraft. Our men, women and children hid in the caves ten times before sunrise. When at last we understood the sign language of the Dropas, we realized that the newcomers had peaceful intentions". The disks were labeled the Dropa Stones. Subsequent investigations have found a total of 716 Dropa Stones in the Baian-Kara-Ula Mountain caves. The Dropa Stones were sent to a variety of scholars for investigation. One of them, Professor Tsum Um Nui of the Beijing Academy for Ancient Studies, found that the spiral grooves were actually a line of characters written in an unknown language. In 1962, he announced that he had managed to translate the language. For a long time, the Peking Academy of Prehistory forbade the professor from publishing anything about the Dropa Stones. However, after many years of debate he published his hypothesis. Tsum Um Nui claims that an alien spacecraft crashed in the Bayan Har Shan region 12,000 years ago. The occupants were aliens called Dropa or Dzopa. The Dropa could not repair their craft, so they tried to adapt to the conditions on Earth. Meanwhile, the local Ham tribesmen hunted down and killed most of the aliens. Supposedly, the aliens had intermarried with the locals, making identification of the origins of the skeletons more difficult. ​Many people have challenged these claims and Tsum Um Nui was forced to resign from the Beijing Academy. The Dropa Stones have been disappearing all over the world and are not available for public viewing at any museum. However, pictures of the artifacts do exist. The following website is a detailed and very easy read about the dropa stones. In 1938, an expedition was conducted, led by Dr. Chi Pu Tei, an archaeologist with the Chinese Academy of Sciences in Beijing, , into the Baian-Kara-Ula mountains of China, looking for evidence of ancient civilizations. he was trying to find shelter in the Kunlun-Kette mountain chain, when a team member entered a cave and found strange inscriptions on the walls. At the back of the cave they found several tombs, aligned in a row, containing strange-looking skeletons, each measuring 1 metre 20 centimetres in length and having an abnormally large skull. Buried with the skeletons over 700 stone discs were discovered. Not knowing what they were, the team collected the stone discs up and took them back for study. 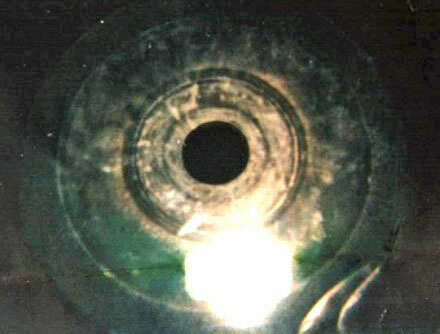 The discs are around 1 foot in diameter, with two spiral grooves moving out from a centre hole. They ended up in storage for over twenty years, before Tsum Um Nui, found out about the disks, and was given the permission to study them further. This is when something amazing is discovered to be contained on the stone discs, an amazing story which would cost tsum his reputation, and ultimately his life. the Chinese Academy of Sciences tried to ban the publication of these findings, but eventually the story of the Dropa tribe and their stone discs was released. Russian researchers requested the discs for study, and allegedly several were shipped to Moscow. Once there, it is said that they were scraped for loose particles and put through a chemical analysis which revealed that they contained large amounts of cobalt and other metallic substances. As recorded in the Soviet magazine Sputnik, Dr. Vyatcheslav Saizev describes an experiment where the discs were supposedly placed on a special turntable, whereby they were shown to 'vibrate' or hum in an unusual rhythm, as though an electric charge is passing through them. ​However, fast forward to present day and no evidence survives of the discs, nor Tsum himself, nor the ridicule he received which cost him his life. It appears as though the discs have been skilfully transformed into an apparent hoax. Baian-Kara-Ula remains one of China’s most remote regions, Its mountains reach as high as 5,000 metres, a new expedition is being prepared to this remote place, largely funded by Chinese media companies, i will keep you posted on what they discover. The story of the mysterious Dropa Stones originated in the late 1930s when a professor that specialized in studies surrounding archaeology named Chi Pu Tei led quite a few students on a special expedition. These individuals set out for the famous Himalayan Mountains. Little did the archaeologist enthusiasts know that they were about to stumble upon one of the most controversial discoveries in the world. When it comes to topics pertaining to UFOs, aliens, close encounters, and even conspiracies, the mystery of the Dropa Stones remains to be one of the most researched and highly debated. 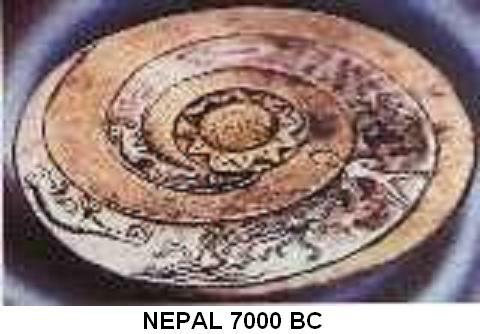 Throughout this guide on unsolved mysteries pertaining to UFO related artifacts, you will learn many important facts pertaining to the mysterious Dropa Stones that were apparently uncovered in caves that were part of the Himalayan Mountains. When Professor Chi Pu Tei elected to set up an expedition for his archaeology students, his goal was to allow his students the ability to study many popular caves that were known to interlock with one another within the mountains of BayanKara-Ula. As the group entered the dark, mysterious caves, they were fascinated with the pristine natural beauty. Many were in awe of the structure and overall appearance of the caves. However, these characteristics were quickly forgotten when the class stumbled upon what appeared to be a type of tomb for the dead. There were quite a few graves contained in the cave. They could tell whoever created the graves, did it with care as they were perfectly aligned. Upon further inspection, the expedition team discovered skeletal remains in the graves. The bones looked similar to those found in humans, but there were distinguishable characteristics among all that are not too familiar with the general human population. The students noticed that the skulls in each grave were relatively large. If only one person’s remains had been like this, it would not have appeared so unusual. That was not the case, though. All of the graves uncovered this common characteristic. In addition to the unusual head structure, the team noticed that the bodies were all very small in length. Furthermore, the arm bones and the bones of the legs of the remains appeared to be exceptionally thin. It was at that time that the students developed a theory that these could be the remains of a special type of race of humans. As the expedition team continued to research the skeletal remains within the cave, they found another discovery. One of the students noticed a relatively large circular stone. As more students got in on the search, many more of the circular stones were discovered. It has been reported that the first disk that was discovered had a diameter of nine inches and nearly an inch in thickness. In the middle of the stone, there was a center that was also nearly an inch in diameter and was perfectly cut. 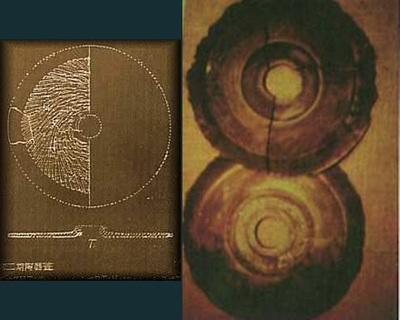 Upon further inspection, a type of spiral etching was found on the surface of the disk. The etching was identified as hieroglyphics, a special type of communication. There were many attempts to uncover the meanings of the words contained on the Dropa Stones. Unfortunately, a revelation would not be made until over two decades later. A scientist from China was successful at decoding the script on the stones in the year of 1962. This scientist’s name was Dr. Tsum Um Nui. He knew the history of the disks and had always been intrigued by them. As a result of his curiosity, he set out to discover what they said. It was a challenging task as the language contained on the disks was unknown and the letters were microscopic in nature. In addition to this, they spiraled around the disks in a unique fashion. Dr. Tsum Um Nui eventually translated the stone that he had been researching and discovered that a group of people that identified themselves as “Dropa” placed the messages on the stones. However, the stones were believed to be approximately 12,000 years old and the message that he deciphered was considered to be unusual for that time frame. A story was told of a special space probe from another planet in the universe. This probe experienced complications and then crashed into the Himalayan Mountains in the BayanKara-Ula region. It told of the fact that they were peaceful, but that the tribe referred to as the “Han” that lived in the region where the Dropa landed misunderstood the tribe and even killed off some of the members. The Dropa communicated through the means of sign language. However, the Han Tribe had no idea if they meant harm or they were peaceful. However, after some time, they came to realize that the Dropa were a peaceful tribe and intended no harm. The issue was that they were unable to repair the damages to their ship and were unable to return to their home planet. The tribe was relatively small in nature. Today, it is said that these two tribes continue to live in the region. The average heights of the tribes are between three and a half to four and a half feet tall. Their bodies weigh up to about sixty pounds. Could it be that the tribes that are in the mountain today are the ones that the Dropa Stones speak of? Perhaps we will never know…this is why the Dropa Stones continue to be one of the greatest unsolved mysteries of the world. 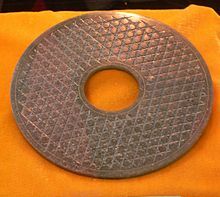 Jade bi (discs), from China, that resemble modern-day CD's or donuts, and date to the late Neolithic Period, Liangzhu culture (ca. The Mysterious 12,000 Year Old Dropa Stones, Evidence Of Ancient Alien Contact? The Mysterious 12000 Year Old Dropa Stones, Evidence Of Ancient Alien Contact? more video for Ancient Discoveries: - Civilisation (1969) Full Part 1 to 13. From Dropa Stones to Impossible Fossils here are 13 Mysterious Unexplained Ancient Artifacts. Can you BELIEVE these exist? Dropa Civilisation heiroglyph has been decoded. Dropa Stones And China Ancient History Linked To Mankinds Genetic Holy Grail. Trinidad James - All Gold Everything (Explicit) - YouTube https://www.youtube.com/watch?v=7LOZhaxTw0I. Ancient Aliens: The Mystery of the Dropa Stones!! Repressed student scholar Matt Loesby discusses the possibility of an ancient alien race visiting Earth 12000 years ago. 1. Cruisin' 2. “Art of the Deal!” 3. Demons. Dropa Stone Discs with 12000 Year Old Alien Glyphs 2016.
update1 to china's dropa stone alien 3 u f o 's ofthe1976 nasa stdf5 mission u f o 2. Guest JOSH EAST shares his own experiences with the Crystal Skulls, the Dropa Stones from China, and other sacred objects. Watch more video for Ancient Discoveries: - Civilisation (1969) Part 1 to 13 : - The Ancient Greeks: Crucible of. The Dropa Stone performs "Honeycomb" featuring the talented Tina Nicole on vocals live at House of Blues Orlando on 2-22-13. COR 1 May 2, 2012. Whats up NASA? The Dropa Stone Live @ The Viper Room! Get your tickets NOW! This show will sell out! The Dropa Stone: Riding the Musical Wave (2013) Produced by: Jay Brian Productions www.TheDropaStone.com www. A fan shot bootleg of The Dropa Stone performing during their recent Hard Rock Live set! The Dropa Stone "Goes Pink" Live at the Dunedin Brewery - "TIME"
The Dropa Stone "Goes Pink" at The Dunedin Brewery on June 22nd, 2012. "Like" The Dropa Stone at: www. The Dropa Stone performing "Kashmir" at their CD Release Show -- With Justin Henry on guitar. Dropa Stones - der Alienfake ist aufgedeckt! New E.P. from The Dropa Stone coming soon in 2015! www.Facebook.com/TheDropaStone www.TheDropaStone. Short clip from the plethora of demo's from pre-production! Stay tuned for more in 2010! Enjoy! Filmed and recorded live Oct.27th at Karma Night Club in Mansfield, OH. Filmed by Bryce Millikin (c) 2011 Jeff Bell. Dropa Stones | by Amandeep Singh. The Dropa Stone Live at Jambando at the Plaza Live Outdoor stage. 12-7-13. Crédito: Texto - Eduardo Logan Narração - Felipe. From the mysterious Shangri La paradise in the mountains to the stories of the Yeti one of the most famous myths in the world! Dropa Live at the Crystal Ballroom, 8/7/11. The Mysterious Dropa Stones – Fact or Fiction? Dropa Style - Dot Cris (Iyara Diss) Dj Chigga Contact Information: djchigga01@gmail.com WhatsApp: +1(876) 595-6444. The Dropa Stone laying out their own version of The Who's "Eminence Front. :" Live at the Plaza Theater. Orlando, FL www. ALIEN UFO Landings DROPA DISC Translations of Alien Contact of China Pyramids. 4000 Year-Old "CD-ROM" Found In Ancient Palace? we did this video da same day of that magnolia shorty video. Support the stream: https://streamlabs.com/airyylive +1. Dorpa Stone কি? What is Dorpa Stone? Alien Invaders In The Himalaya Mountains? More information: minimalstuffrecords.com Video Encoded by Label Worx - http://www.label-worx.com. Dropa Draco Store: https://teespring.com/stores/dropadraco-store Thanks Blunder and Chimp! These few videos I release at the same time, are where the research is leading me. Where does your research lead you? Dropa like if you want more content like this SHAREfactory™ https://store.playstation.com/#!/en-gb/tid=CUSA00572_00. ET Alien Race Dropa Grey Hybrid Voice Message. Hey Guys We Are A Sniping And Trickshoting Team. 5 Shocking Discoveries That Make Us Rethink History! Most MYSTERIOUS Ancient Artifacts Discovered! Clips from all the movies i find crazy funny. 10M viewsHow To Reverse Diabetes?